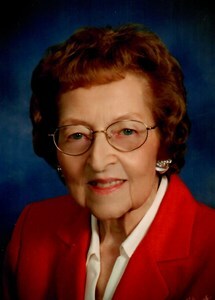 Joyce Marie Kastens Domsch died on January 29, 2019 in Shawnee, Kansas. She was born to Albert and Louise (Carstens) Kastens on September 17, 1929 in Atwood, Kansas. She grew up on their farm north of Ludell, Kansas. On November 17, 1948, Joyce married Bob Domsch, also of Ludell, and they made their home on the John Focke farm until Bob’s death in 1959. Joyce and their three children then moved to Atwood where Joyce began her 35 year career with Farmer’s Bank. She retired in 1994 as a senior vice-president. Joyce was active in her church, serving as Sunday school teacher, treasurer and financial secretary for many years at Grace Lutheran (now Redeemer) in Atwood. Joyce lived in Kimberling City, MO from 2000-2014, when she moved to Shawnee, KS. Besides her husband and parents, Joyce was preceded in death by her son, David M. Domsch, seven sisters and a brother. She is survived by her son, Ron Domsch (Donna) of Shawnee, KS; daughter, Laurie Domsch of Kimberling City, MO; her grandchildren, Jennifer Bohr (Casey), Robert Domsch (Ashley), Daniel Domsch (Leslie), Quentin Domsch (Jody), Austin Domsch (Jill) and Zack Domsch (Jewel); fourteen great-grandchildren and her sister, Anita Focke. In lieu of flowers, donations may be made in her memory to the KU Endowment - KU Alzheimer’s Disease Center, c/o Lindsay Hummer, Mail Stop 3012, 3901 Rainbow Blvd., Kansas City, KS 66160. Add your memories to the guest book of Joyce Domsch.